Oct. 2 — The first full day of the 2017 “In the Footsteps of Che Guevara International Brigade” began with more than 250 delegates from 21 countries enjoying a well-prepared breakfast in the dining hall of the Julio Antonio Mella International Camp near Caimito, Cuba. As the morning progressed, many of the delegates slowly drifted away from the dining hall to explore the surrounding scenery of the camp before the start of the day’s activities. In the first item on our agenda, we marched to the monument of Julio Antonio Mella, a young revolutionary killed by the Batista dictatorship, for whom the camp is named. Upon our arrival at the site, a floral wreath was laid at the monument, and touching words were spoken by a Pioneer elementary school student in memory of Mella and the legacy he left behind. Delegations from around the world held banners, signs and flags to show their solidarity with the Cuban people. Banners from the Chicago, Albany, N.Y., and Washington, D.C., Cuba Coalitions in the U.S., and stunning banners from Chile and Greece, were joined by two handpainted Workers World Party/Partido Mundo Obrero banners. Both had portraits of Che Guevara and the historic leader of the Cuban Revolution, Fidel Castro. 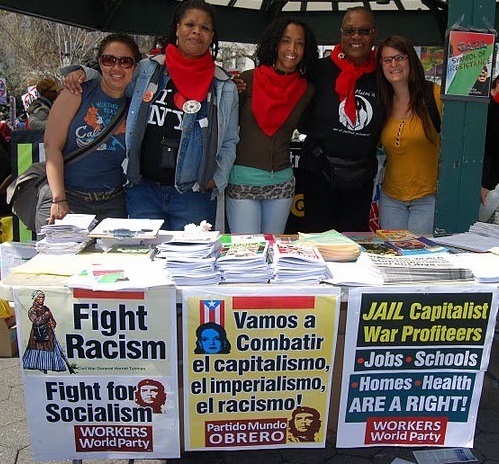 The bilingual banner demanded “End the U.S. Blockade of Cuba/Fin al Bloqueo Contra Cuba.” The other echoed Cuba’s internationalism by opposing the U.S. war against Venezuela, Syria, Iran and the DPRK as well as demanding an end to the economic war on Cuba. 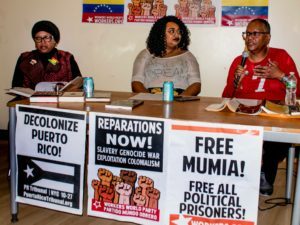 A delegation of Puerto Ricans held a banner calling for an end to PROMESA, the bankers’ colonial financial control board, designed to squeeze the last cent out of the island’s working class. Following the brief ceremony, the brigadistas congregated in the camp’s theater to watch a beautiful slideshow about Che Guevara.The song “Che Comandante” was the background music, and overwhelmed by emotion, everyone began to sing along, echoing the happiness felt in our hearts for the legendary man who fearlessly helped lead the Cuban Revolution. We were greeted by Fernando Gonzalez Llort, the president of Cuba’s Institute of Friendship. 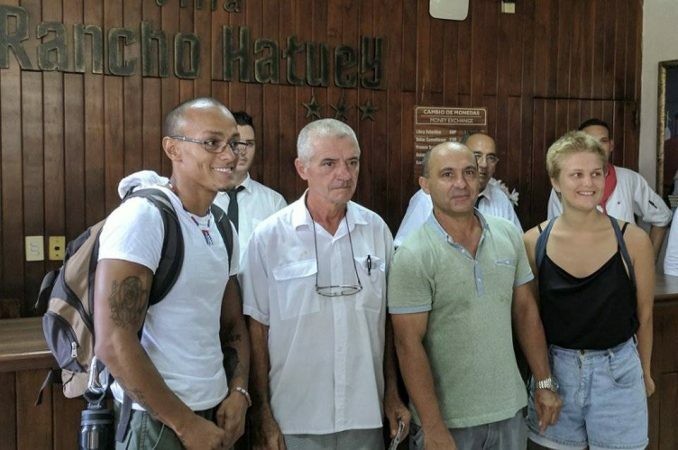 One of the legandary Cuban Five, Gonzalez Llort was imprisoned in the U.S. for over 15 years for defending his country against a right-wing overthrow. We also listened to inspiring stories from four of Comandante Che’s former associates. The day ended with a hearty dinner of rice, beans, chicken and ox-tail, followed by more music, singing and dancing at the Noche Cubana as we became acquainted with representatives of the global movement in solidarity with socialist Cuba. Indeed, a beautiful ending to a beautiful first day, a beautiful beginning to the brigade’s visit. For the next two weeks we lived, worked and traveled together, walking where Che walked. Adapted from a talk given Nov. 11 at a Workers World Party forum in New York City.